With all the deals flying around lately, we know many of you have recently wrapped your fingers around a brand spanking new phone or tablet. Now comes the time to fill it with content. Just because the device likely came with Play Books pre-installed, that doesn't mean it's your only option for skimming through books. Amazon's massive collection of ebooks are only a click away, and now the company has announced its second annual 12 Days of Deals promotion. From now until December 14th, a selection of Kindle books will be offered with major discounts. Each day brings in a different theme. Today's theme is "Best Books of 2013" and features Dona Tartt's The Goldfinch, Philipp Meyer's The Son, and Hannah Kent's Burial Rites - all for $2.99. Keep your eyes glued to the Kindle Daily Deals page to hit up the current discounts, and look for a new wave to roll in at 12:01 am PST each day. Of course, Amazon's books require that you use its Kindle app. If you would prefer to use Play Books instead, don't fret, Google's 75% off Cyber Monday sale is still going on. Either way, don't let this time to catch up on all the books you missed go to waste. 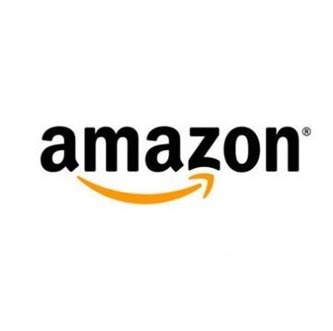 SEATTLE--(BUSINESS WIRE)--Dec. 3, 2013-- (NASDAQ: AMZN)—Amazon today announced its second annual 12 Days of Deals for books, a holiday promotion where popular and best-selling books are deeply discounted off their list price. Starting today and continuing through December 14, both print and Kindle books will be discounted under daily common themes that will make it easy for customers to stock their own libraries or buy books for everyone on their gift lists. Today’s theme is Best Books of 2013, featuring Donna Tartt’s top-rated book, The Goldfinch. Customers can check back every day at www.amazon.com/dealsinbooks to find deals in categories such as Young Adult, Cookbooks, Gifts for Her and Gifts for Him. Kindle gifts can be sent to anyone with an email address—for immediate delivery or scheduled for a future date—or customers can print a gift notification at home for personal delivery. 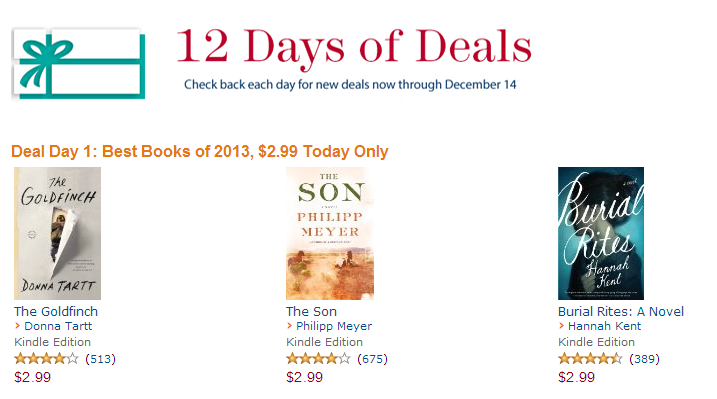 To learn more about 12 Days in Deals and to see new deals every day for the next 12 days, visitwww.amazon.com/dealsinbooks. In addition to this seasonal promotion, the Kindle Daily Deal offers a new Kindle book deal every day, year-round, for both adult and young readers. To sign up for daily emails, visitwww.amazon.com/kindledailydeal. To see the entire list of Editor’s Picks for Best Books of 2013, visitwww.amazon.com/bestbooks2013.